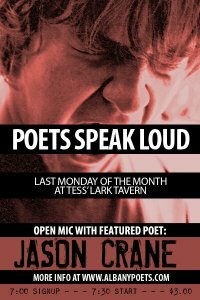 This poster says 7:30 p.m., but it starts at 8 p.m.
I’m the featured poet tonight at Poets Speak Loud at 8 p.m. at the Lark Tavern, 453 Madison Ave. in Albany, NY. It’s an open mic, too. Sign-up starts around 7, so bring your own work along. I’ll be reading from my just-released book, Unexpected Sunlight (FootHills Publishing, 2010). Hope to see you there!